A Fresh Answer To Vermeer's Mystery : 13.7: Cosmos And Culture The work of the Dutch master Johannes Vermeer has long puzzled the art world. Some of his pieces just don't quite fit. They're a little off. What gives? Author Benjamin Binstock has an idea, an idea that commentator Alva Noë finds appealing. 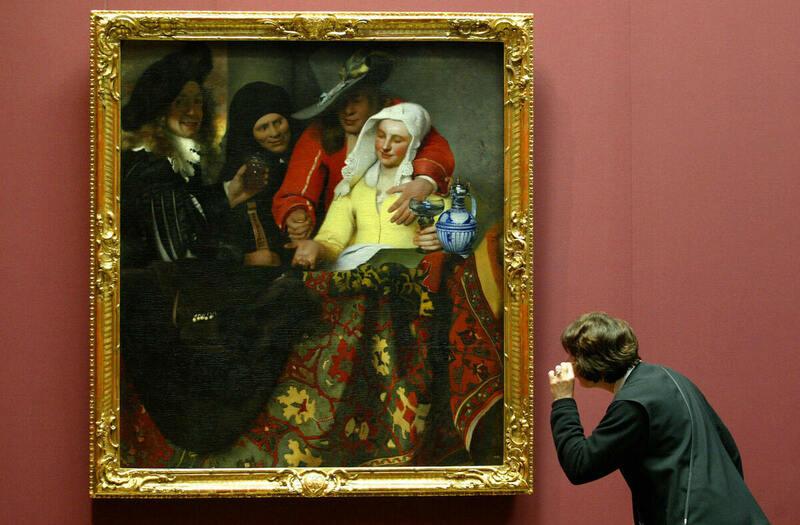 The Procuress, painted by Johannes Vermeer in 1656, hangs in a Dresden, Germany, museum in 2004. While this particular work is not in question, Benjamin Binstock argues that other pieces attributed to the Dutch master are by an apprentice and a member of his household. "We have learned to love all things that we now love." The second is that you can't recognize a painting for what it is just by looking at it. Getting to know, and so coming to love, a work of art, or the work of an artist, is itself hard work. Binstock compares it to bringing a distant planet into focus. It takes a lot of knowledge, and a great deal of careful attention to what others (scientists, historians, critics) have learned and thought, to be able to see what is out there. Now, imagine a family: the father is a painter. The mother, the children and the maid are his models. The father works at home. The art changes and develops as his models grow up and the relationships among them evolve. In time, one of his models, a child, takes up the brush and becomes the father's assistant and then his apprentice. The apprentice is confined, literally and figuratively, to the materials of the father — the same interior scenes, the same pigments, the same bolts of canvass. The apprentice seeks to imitate the master. But the master is also influenced, or even inspired, by the work of the pupil, just as both of them share models because, after all, they share a single studio, home and family. This, Binstock claims, is exactly the situation in the Vermeer household. Scholars have long found it difficult to come up with a coherent story of Vermeer's development, or even of the order in which the very small number of extant paintings (some 30 odd) were made. Some of the paintings just don't fit. They depict the same cast of characters, occupying the same rooms and wearing the same clothes. They're made out of the same paints, using the same basic materials and techniques. But they look different. They lack the technical facility and compositional understanding of the others, even as they are also, sometimes, free-spirited and vigorous — worth loving! — in a way that is not typical of Vermeer. Binstock is not alone in noticing that a good sixth of Vermeer's pictures don't seem to fit. He may be alone in advancing an account that explains not only their differences, but also their similarities. He says that, contrary to what has been widely supposed, Vermeer did have an apprentice: his daughter Maria (of pearl earring fame). Binstock also offers plausible explanations of why it has taken until now for us to realize this. First, in the Delft of Vermeer's day, there was no requirement that children be registered as apprentices. Second, girls and women were not encouraged and Maria would have been expected, or perhaps required, to give up painting at marriage. Hence there is no sequel to her work in her father's studio. Finally, Vermeer's family paid the bills with the money from his paintings. Indeed, they traded paintings for food. Vermeer's widow may have deliberately passed off Maria's works as by the master himself in order to pay off debts. Contemporary scholars scoff at approaches to art that lean too heavily on cults of personality or biographical detail. After all, when work is good, it stands on its own and doesn't require a romantic backstory. Quite right. But Binstock makes the case that, where Vermeer is concerned, the family isn't backstory. Vermeer painted his family. And his family painted right back. Nor can Binstock be accused of making excuses for Vermeer, as if explaining away his bad paintings. Maria's paintings — if that is what they are — are very good. They are genuine artistic responses to the work of her father and, Binstock shows, they compelled her father to respond to them as works of art in turn, actively influencing his choices and development. She never equalled her father. But then her apprenticeship was very brief. It is truly extraordinary what she accomplished in a small number of years. If Binstock is right, then seven paintings widely taken to be painted by Johannes Vermeer — and that fetch prices at auction in the millions of dollars — are not by his hand at all. Which is of course not to say that these paintings are not Vermeers. They are by a Vermeer, after all: Maria Vermeer. What is it to be a Vermeer, anyway? With millions of dollars potentially hanging in the balance, it will be very interesting to see how art history, as a field, responds to Binstock's challenge. The New York Humanities Institute is sponsoring a free, day-long symposium on Binstock's book — Vermeer's Daughter? — on Saturday, May 18, in Manhattan. Binstock will make his case. A very impressive cast of writers and artists will respond.